Christina, my oldest daughter has toothache. She could not eat the all hard. Would I make porridge for her, she like the beef broth better than others. 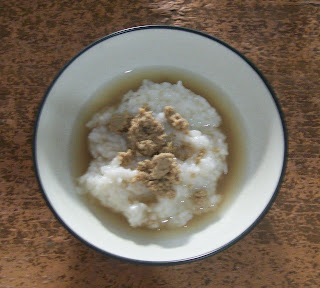 Well porridge mixed with beef broth, not stirred together with the porridge, but the porridge was placed in a bowl, pour the gravy beef broth with a bit more, "well, it's delicious," she said. If eating porridge with no liquid, such as porridge with poached egg and sweet soy sauce, she's less likely. This recipe is very easy, meat chopped or can be blended using a blender specifically for meat. The meat becomes more subtle and gentle, allowing the child to chew and swallow. This is can be one alternative menus besides chicken porridge. Chicken porridge which I often encounter is usually given: chicken which is cut in a little pieces, scrambled eggs are sliced thin, cakue, fried onions and scallions. Because my children does not like the onions, would I make her porridge of beef broth . It is much easier because it is using only one material, the beef. Just try ..
1. Meat cleaned, and blended with a special blend for meat. 3. Insert meat that had been blended, stirring. 5. Steam in the steamer for 15 minutes. 6. Serve with porridge while warm. Ps: If you want all the meat mixed with gravy, mix well. If you do not want beef with gravy destroyed, do not stir to mix at all. If you do not like meat blender, because it is too soft, the meat can be chopped up fine.